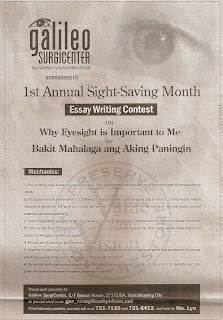 Essay Writing Contest - Galileo SurgiCenter ~ Philippine Freebies, Promos, Contests and MORE! Now here is an essay writing contest for all you writers. The contest is sponsored/featured by Galileo SurgiCenter promoting its 1st Annual Sight-Saving Month. The theme is "Why Eyesight is Important to Me" or "Bakit Mahalaga ang Aking Panigin." Submission of entires could be done through email! Cash prizes are at stake so send those entries now! up to ilang entries po ang pwedeng isend? salamat po. gusto ko sumali dito. sasali talaga ako. promise! sasali din ako! hehe. salamat po sa pagbahagi. of course you can! just make sure your post links back to me. good luck! hey, thanks for this really informative post ;-) you have a really great blog going! 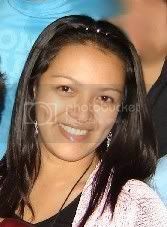 totoo kaya to? nag announce na ba sila ng winners?